Empowerment of Indian women is still a debatable issue in the country. At a time when only 26.6% of all Indian women above 25 are able to get secondary education and when Parliament has only 10% women representatives, it is hard to think about their role in the Indian business structure. Since historical times, businesses in India have been a male dominated activity, with little or no role for women. But times are surely changing, and more and more women are actively joining business and entrepreneurial role. Some of the major success stories scripted entirely by women in the last few decades include that of Shri Mahila Griha Udyog Lijjat Papad, a co-operative style business unit which did business worth Rs 600 crore in 2010, and employs over 42,000 women all over India. Then there is the story of Kiran Mazumdar-Shaw who founded India’s first biotech company: Biocon. 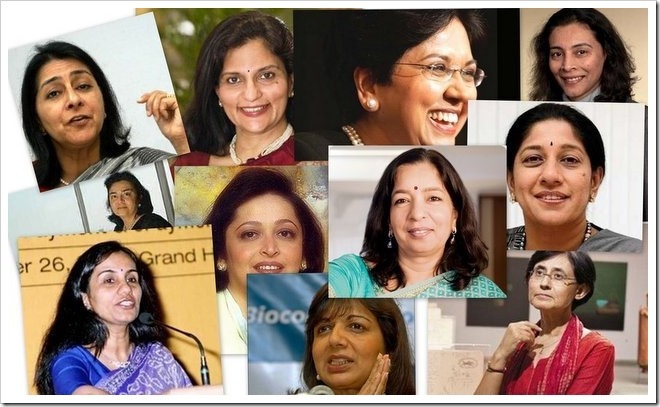 Fortune Magazine recently came up with a list of the most powerful Indian businesswomen, who have made a mark on the corporate scene, and leading their companies to incredible growth and development. Chanda Kochhar has been hailed as the most powerful Indian businesswomen by Fortune magazine, annual ranking. She joined ICICI bank as a management trainee in the year 1984, and with her hard work and persistence, she has reached the top of the organization. In 2009, she replaced KV Kamath to become Managing Director and CEO of ICICI Bank. Globally, she is ranked 4th in terms of most powerful business women. Shikha Sharma is the second most powerful Indian business women in India. A graduate of IIM Ahmedabad, Shikha spent 29 years in ICICI Bank, before joining Axis Bank as their CEO. Under her tenure, Axis Bank has grown tremendously, as the bank’s assets swelled to $55 billion showing an increase of 30% between 2012-2013. She has doubled the number of branches and ATMs across the country, and has helped Axis Bank become India’s 4th largest private sector bank. She has famously said that she wants to make Axis Bank India’s JP Morgan. Aruna Jayanthi, CEO of Capgemini India is the third most powerful Indian businesswomen. She is overseeing 40,000 employees spread across 9 Indian cities, and helped Capgemini to make a solid base in Indian subcontinent. She has ensured that the company follows a rigorous growth curve, and has some ambitious plans for the future. By 2015, she aims to increase the total headcount to 70,000. 4th most powerful Indian business women, Preetha Reddy is the managing director of Asia’s largest healthcare provider. A dream which started with 150 bed hospital in Chennai, Apollo Hospital now offers more than 8000 beds spread across 46 hospitals with an annual revenues of Rs 3000 crore. Under the able leadership of Preetha, Apollo is on a tremendous expansion mode. World’s third largest and India’s second largest tracker manufacturing company Tractors and Farm Equipment Limited (TAFE) with annual revenues of $1.3 billion is being led by Mallika Srinivasan, who is India’s 5th most powerful businesswomen. During her leadership spanning over 30 years, TAFE has grown more than 30 times and expanded to over 86 countries all over the globe. Awani Saglani Davda, CEO, Tata Starbucks India. Naina Lal Kidwai, Country Head, HSBC India. Women entrepreneurship in India is picking up, and there is tremendous momentum building up as more and more women are getting educated and awareness is increasing. But there are lots of challenges which still negatively affect this development. For a sustained and dependable development of the country, more Indian women should jump the band wagon, and start making a difference to the world.